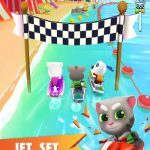 Talking Tom Candy Run is probably one of the most exciting – not to mention the sweetest – endless runner currently available out there. The plot of the game is simple: a burglar has broken into Tom’s candy shop and stole his goodies. Now Tom, Hank, Angela, and Ginger – alongside a few special buddies – must catch him. Luckily, the burglar is leaving a good bunch of sweet evidence behind him! Your mission is to follow the candy trail and collect them all. 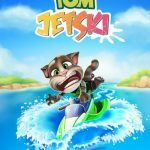 Earn coins and points and take Tom and his friends to new worlds of pure adventure. 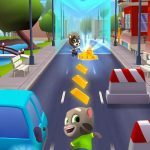 There are several Talking Tom Candy Run tips and tricks that you should definitely get to know before embarking on this new adventure. 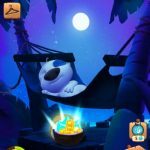 So check out our Talking Tom Candy Run beginner’s guide to learn how to earn more coins, score higher, and open new exciting worlds. The control system is not very complicated. But it is crucial for you to learn how to master each movement. You can find the jump button on the lower right corner, while the slide button is located on the left side of the screen. If you need to get past an obstacle, tap the jump button once. If there is a big gap between two objects or platforms, tap the jump button twice. The double jump will also help you get hard-to-reach rewards. The slide button will help you if you need to get passed a little gap between tall obstacles. It can also help you cancel badly-timed jumps. If your character is in the air and you tap and then hold the slide button, you will come down rapidly. Attention though! Don’t use this move if there are obstacles that you could hit on the ground. If you combine both controls, you will super-charge your character. Tom: his Superhero power-up allows him to fly and destroy obstacles. Hank: his Hamster Ball power-up allows him to smash through obstacles. Angela: her Candy Princess power-up turns obstacles into candies. Ginger: her Skateboard power-up destroys obstacles. Ben: his magnet power-up will attract everything, including more power-ups. Fireman Ginger: his Water Cannon power-up destroys obstacles with his water hose. Brainiac Ben: with his Secret Formula, he can turn into a huge monster who destroys it all in his way. Right Arrow: this orb will make your character run faster. Chests are usually available in the checkpoints of the tunnels you run through. However, you can also purchase them with coins and diamonds. The more chests you buy, the more chances you have to find special characters and useful items. So make sure to purchase as many chests as possible. Unicorn: he will probably be the first one you will get. This buddy’s power-ups appear randomly on the screen. This means you have no control over where the power-ups show up and you will have to get them yourself. Happy Cloud: this buddy will protect you from obstacles. Smiley Face: this buddy can revive you once per turn. Dragon: this buddy will enhance the characters’ power-ups. The effect of their power-ups starts as soon as you begin your adventure. So you should select a buddy right before you embark on your next adventure. Power-ups become available when you collect lightning orbs. As soon as you grab a power-up, a set of bars will appear on your screen. This means that the respective power-up will stay active until the bars disappear. If you want to increase the duration of the bars, you will have to upgrade the character. With each upgrade, the number of bars will increase. You will acquire a character’s power when you collect an orb with a lightning symbol. If, for example, you are using Angela and you grab a lightning orb, her Candy Princess powers will be active for a few seconds. In order to upgrade a character, you will first have to collect the character’s cards from chests. Upgrading your characters makes a huge difference, as you will be able to collect more candies and coins and pass obstacles more easily. The arrows you find as you follow your candy path offer you valuable indications as what to do next. If you pay attention to the arrows, you will know when you need to jump, get down from platforms, or slide. Completing daily missions will help you win diamonds and coins that you can use to buy pink or epic blue chests. These rare chests may contain new characters. So save your diamonds to buy them! And this is where our useful collection of cheats and tricks for Talking Tom Candy Run ends. We hope you will find them useful and put them into practice! If there are more tricks you would like to share with us, we would love to hear about them!